A lot has happened since I last posted a note on this blog. I’m kind of stunned. My new embroidery boutique, In Stitches, opened on Tuesday. 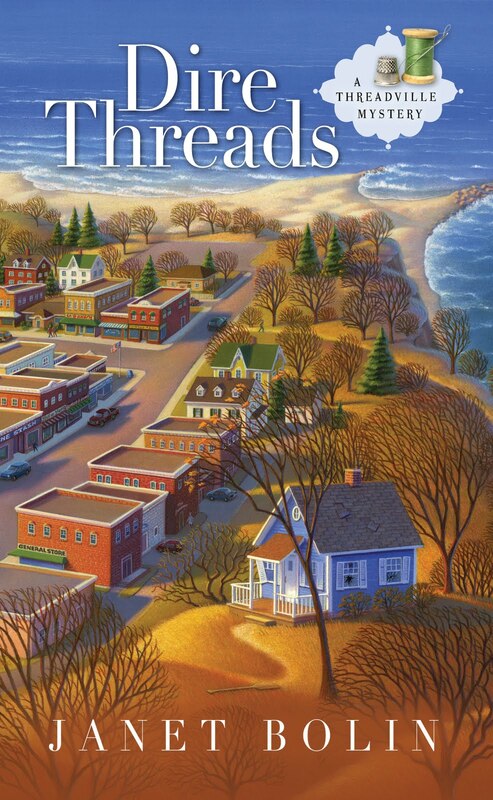 I could hardly wait to welcome the tourists who flock to Threadville to learn all the latest needlework techniques. However, the first person to enter my shop on opening day was Mike Krawbach, Threadville’s zoning commissioner. He seemed very happy to inform me he was turning down my application for a building permit. I’d wanted to renovate the sweet little cottage in my back yard so I could rent it to tourists who would love its proximity to a good canoeing river and a sandy Lake Erie beach. Mike planned to expropriate the land my cottage stood on, bulldoze the cottage, and build public outhouses! I’m afraid I made some dire threats, in public. I didn’t really mean them, but when Mike ended up dead in my back yard early Wednesday morning, villagers remembered what I’d said. Mike’s death was shocking and horrifying. To make matters worse, Threadville’s police chief seems to think I murdered Mike. I don’t even know how Mike got into my locked back yard. Yes, I keep it locked now. Remember, last month, I said I was going to get a dog, and wanted suggestions? I didn’t get one dog—I got two. 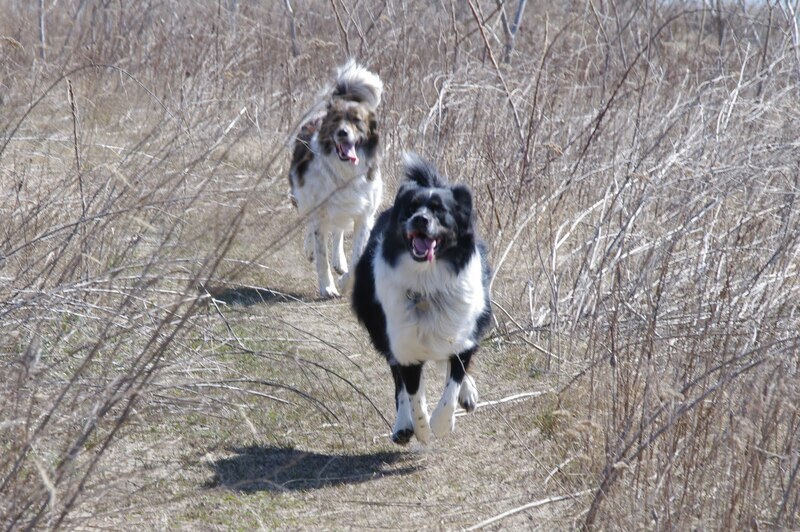 They’re adorable, an energetic brother and sister pair I’ve named Tally-Ho and Sally-Forth. They were rescued from the streets of Akron when they were about four months old, and then spent the next eight months together in a very nice rescue facility, waiting for someone who would adopt them both so they could always be with each other. I embroidered beds for each of them, but they curl up like puppies and sleep cuddled together. After only a couple of weeks, I can’t imagine how I coped without them. They comfort me and distract me from the realities of life—and death. And now, to make certain Sally-Forth and Tally-Ho don’t lose me to a prison cell, I’m going to have to find out who really killed Mike Krawbach. My best friend, Haylee, who owns Threadville’s fabric store, The Stash, has already begun helping me investigate Mike’s death. Haylee’s three (yes, three) mothers, who own the yarn shop, notions boutique, and quilting shop, are going to want to poke their noses into it all, too. Keeping Haylee’s mothers out of mischief may be more difficult than corralling Sally-Forth and Tally-Ho. Uh-oh. Have you ever seen outhouses as a threat? Please return to Killer Characters tomorrow to welcome Marcy Singer from STITCH ME DEADLY by Amanda Lee. I'm rooting for you to find the killer with the help of Haylee and the moms. Thank you Dru. I'm scared that the killer may come back. Willow... if this Mike guy upset you so badly, there have to be a lot of others he made angry... follow the fury!! Thanks, Victoria, good idea! I'll try to keep that in mind. Unfortunately, everyone in the village knows that my best friend, Haylee, refused a second date with him. Some people suspect her! Congratulations on adopting Tally-Ho and Sally-Forth. They'll let you know if the killer lurks around your place! Thanks, Krista, yes, although I haven't had them long, they tell me whenever something outside is not quite right. But I also have to worry about their safety! Ooh, I hate to admit it, but I've encountered a number of extremely threatening outhouses! But that's not exactly what you meant, is it? I absolutely cannot wait to get my hands on this book and find out what's happening in Threadville! You've got your hands full, that's for sure. Perhaps you can task your adorable dogs with tending to the 3 mothers! I'm rooting for you! Julie, I think I meant it that way, too. Outhouses can be scary, including getting to them down dark pathways . . . But these outhouses were going replace my potential rental cottage and threaten my income. Plus be an eyesore. Ugh. Great idea, Erika. Maybe the mothers and the dogs can keep each other out of mischief. Outhouses can be scary. The clack of the door, the darkness inside. So watch you. So glad you have your sweet dogs to keep you company and keep you alert! And do not take anyone else's dire threats to heart. You are innocent! Thanks, Avery. And I really didn't mean the dire threats I made, but of course people remembered them. Harlow, I'm sure that strange things can lurk in outhouses in Texas, too. You must be very brave. Not one but two dogs makes an already excellent tale even better! Outhouses can be very creepy. I don't are what anyone says. Wow, Willow! Life is never boring for you (but I'm sure you'd like it to be someday). I love your two new best friends and good for you for rescuing them. It sounds like it worked out wonderfully for all. But even with them there to protect you, you should be very careful investigating Mike's death. Outhouses.... hmmmm.... I try to stay away from those for a couple of reasons! Mary Jane, I decided that if Charlotte could organize herself and everybody else while looking after (being looked after by?) two dogs, two dogs could be just what I needed, too. Jen, I'm sooo glad I adopted these two before all this started happening! Their love for each other is very sweet. We'll all protect each other. I feel less threatened by outhouses now that Mike is gone, but shhh! Don't tell anyone.